I’m so excited to announce that I’m joining forces with Chicken Farmers of Canada again this year to bring you some amazing Canadian chicken recipes. So let’s kick off the year right with these healthy Coconut Curry Chicken Meatballs. This curry chicken recipe is so darn good, and it’s a Whole30 dinner recipe that makes incredible leftovers. Place all the ingredients (but the chicken) into a high-powered blender or food processor and pulse until chopped. Roll into 1 1/2 – 2″ balls and place them on a lined or greased pan. Bake for 20 minutes, roll the meatballs over and bake them for an additional 15. In a large skillet, over medium heat, heat the coconut milk. Add the rest of the ingredients and simmer for 10 minutes, stirring constantly. Add the meatballs to the sauce, stir them around and simmer for 2-3 minutes. The meatballs are 0 points. The sauce is 7 points for the whole thing, and it makes 20 meatballs so less than 1 point each. 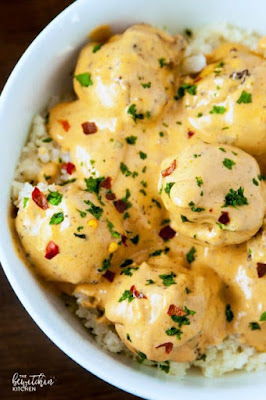 0 Response to "COCONUT CURRY CHICKEN MEATBALLS"